A person can spend many enjoyable hours breaking down a stamp collection, made more enjoyable if a person has an actual plan for doing so. There probably is no one correct way to do this, but the system described below works well for me, and my guess is that most systems will be somewhat similar. Step 1 involves more thinking than doing, but it has often been my personal experience that exercising thought prior to action can provide a number of benefits. In this case, we may begin by thinking of ourselves as travelers. If we were mapping out a route to somewhere, we would want to know our starting and ending locations. When breaking down a stamp collection, we want to know: a) what (in general terms) we have, and; b) what we intend to do with what we have. What we have can range from a valuable, well-organized personal collection to a box of old stamps Uncle Rupert used to keep in the back of his closet, to a carton full of stamps in glassine envelopes we bought on eBay. The idea of, "first, do no harm," certainly would apply to a valuable, well-organized collection, and if our end goal is to sell the collection, we might not wish to do anything other than to take the collection to a reputable auction house and have them sort things out. In any event, we don't want to do anything to make the philatelic items in the collection less organized and/or identifiable. Thus, if we're talking about stamps in glassine envelopes, and there is identifying catalogue information on the glassines, we won't start by taking everything out of the glassines. We will, instead, look over the collection, and get an idea of what we are dealing with. What we intend to do with the collection can also vary widely. Mainly, we're going to either want to add items from the collection in question to our collection, sell items in the collection, or some combination of both. 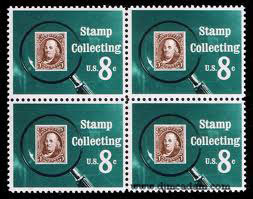 If we are thinking about selling, now is a good time for us to also think about how and where we will be selling stamps. For purposes of illustration, let us say that the collection we are breaking down consists of a worldwide stamp album with a large quantity of used stamps hinged to the pages of the album. There is no real identifying information accompanying the stamps, save that there is a section for each country, and the stamps are organized by date of issue in a more or less chronological order. Let us also imagine that we only collect the stamps of the United States, and that we have decided that any US stamps in the collection we are breaking down will be added to our personal collection if not duplicative, and that all the rest of the stamps will be sold on eBay. We will begin, then, with the United States stamps. Since we collect in this area, we probably already have a USA Stamp Album that houses our collection, as well as a reasonably current Catalogue of United States Stamps or something to that effect. With a good magnifying glass, a decent stamp catalogue, and a few other handy tools, such as a perforation gauge and a watermark detector, we set about identifying which stamps are which and placing them in our album. Obviously, any stamp we don't already have goes in the album, but we might also replace some stamps in our album with better copies, if this is what we find. Now we are left with two groups of stamps: duplicate US stamps, which we can easily identify via our catalogue, and stamps from various countries for which we may not possess a catalogue. If none of these have been removed from the stamp album, one could simply sell the album with the stamps on eBay. This may require taking a large number of photos and posting them on the internet, but it makes for a quick sale. Or, we could sell pages from the album on eBay, without unmounting the stamps, and without identifying them by catalogue number. We could also sell the US stamps separately. In such a case, we would attempt to keep complete sets together and deal with them first, placing each set in an appropriately sized glassine envelope. On the envelope, we would briefly note what catalogue we are using, the catalogue numbers of the items in the envelope, the catalogue value, and information on any defects, such as thins. Then we could sell the items thusly. Would it be worthwhile to acquire a set of worldwide stamp catalogues for use in identifying the remaining stamps in the collection? The answer is purely based on economics. In our article on Choosing the Right Postage Stamp Catalogue, we point out that the retail price of each of the six volumes of the Scott Standard Catalogue is currently not cheap. We do not, of course, wish to sell rare and valuable items for a song, but we also do not wish to spend six hundred dollars or more in order to value and sell two hundred dollars worth of stamps, unless we expect to have significant future use of the catalogues. Judgment is required. If we are members of the American Philatelic Society, we also have the option of selling our items via either APS's Stamp Sales Circuits, which are mailed to requesting members, or through APS's online Stamp Store. This is where identification is critical, and why we have made the notations we have on our glassine envelopes. If one wishes to sell via the Stamps Sales Circuit, for instance, one must write on the cover of the sales book the name of the catalogue used, and within the pages of the book one must identify each set or single stamp by catalogue number and catalogue value, as well as note any defects that would not be immediately apparent. There really is no step three. The key to all this, as is apparent from what is written above, is skill in stamp identification, and that comes primarily from careful practice. At first, determining the actual perforation size of a stamp or finding its watermark can seem difficult and tedious. But, as with any similar skill, over time one can become quite adept at it, and actually derive pleasure from being able to perform such tasks adroitly. Once we have reached that stage, breaking down stamp collections will be found to be both enjoyable and, at least occasionally, profitable.